Rugby Town's chances of securing the United Counties League Premier Division title became even more remote last weekend when they could only draw at home to Peterborough Northern Star, whilst league leaders Daventry continued their imperious campaign with a victory at Wellingborough. The gap is now 12 points with Valley holding just one game in hand over the Northamptonshire club, and unless Carl Adams's side can rediscover the form that they showed earlier in the season, they will struggle to hold on to the second place in the table let alone challenge for the top spot. Third placed Deeping's midweek win at Harborough brought them level on points with Town from a game less played, as they continue to emerge as genuine contenders to Daventry's trophy aspirations. Next up for Rugby is the visit of struggling Kirby Muxloe to Butlin Road this Saturday, with the club offering free admission to all supporters for the game. Club Director Mike Yeats explains the reasons behind the offer: "Saturday's fixture is our third game on the trot at home and our fifth in just over a month, and we are conscious of the budgetary pressures on supporters at this time of year, so we have decided to open the gate for free this weekend. "We hope that this initiative acknowledges the loyalty of our regular fans, and will also attract some new faces to Butlin Road plus some returning ones too. "It is a genuine attempt to embrace the rapidly growing community of Rugby, and invite them along to see what a great facility we have developed here at Butlin Road and hopefully cheer their hometown team on to three much needed points." Saturday's opponents are currently 19th in the UCL Premier rankings following an 18th defeat of their 22 game season to-date last Saturday at Deeping. Rugby won the reverse fixture between the two clubs in Leicestershire at the beginning of November, with two goals apiece from Danico Johnson and Harry Holloway securing a 4-1 success. Johnson made a debut for new club Redditch in their goal-less draw against Lowestoft last weekend, whilst his replacement at Town Edwin Ahenkorah was notching his first goals for Valley with both strikes in their disappointing 2-2 draw with Peterborough. 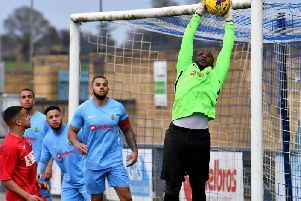 Adams included new signing keeper Louis Connor in his side on Saturday, and there are likely to be more new arrivals this week as he looks to kick-start a team that has started to falter somewhat in recent weeks following the Boxing Day defeat to Daventry. Connor returns to the club for a fourth stint, having started this season at Redditch before moving onto Romulus. He has played under Adams at Stratford and he replaced the previously ever-present Matt Hill between the sticks against Peterborough at the weekend. With midfielder Richard Blythe looked set to join up with Coventry Sphinx alongside the recent departures of Johnson and Lewis Hayden (to Warwick), Adams is looking to boost his squad numbers again with at least three new signings this week - especially as both Stefan Blake and Trey Brathwaite also appear to be no longer part of his plans either.